The price of Natgas has had a tough time of it since peaking in November of last year as it has since fallen a smidge under 50%. Looking at its chart, it becomes immediately noticeable that it has just reached a very important past level of support. Other than the one time in 2015 when the price pushed lower, this $2.5 area has been a zone of strong support as its price has rebounded each of the past 7 times it has been tested. If an investor wanted to take a nibble here assuming this level will once again act as support, the reward-to risk level is extremely high, well above our 3:1 target with a clear exit if natgas closed and held below $2.4. 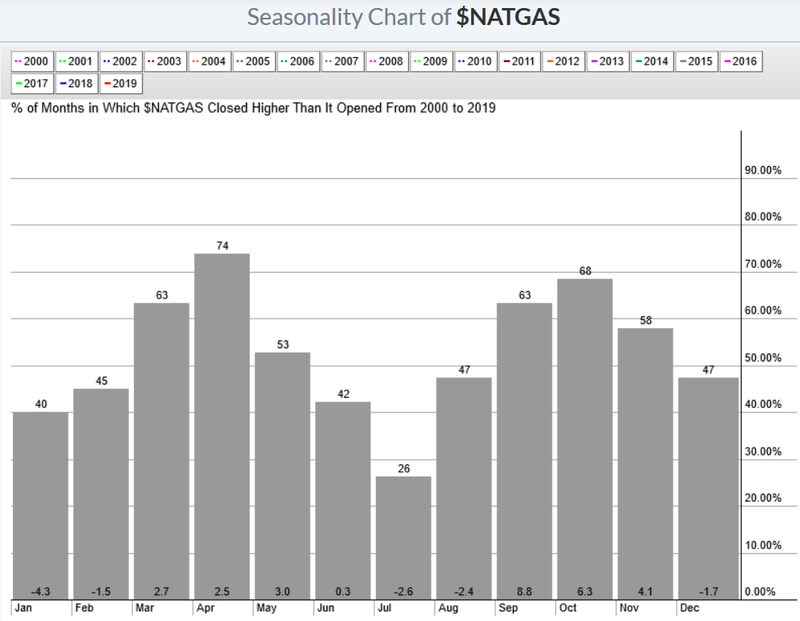 Digging a little deeper to try and find a way to increase the edge, taking a look at seasonality over the past 20 years in the chart below, we can see that buying and selling Natgas in February has not provided that edge. Only 45% of the time has Natgas closed higher at the end of February than it was at the beginning. The other perspective is that buying now and holding through April has historically provided a much higher probability for success. Bottom line is, if this investment is worthy of your investment capital be prepared to be patient for any payoff as that will likely occur in April. Josh Brown (thereformedbroker.com) is a must follow for those who live and breathe the markets as I do. His post from last Friday says so much, so well I had to repost it. Hopefully it sounds familiar. The prices of stocks, however, can and do turn on a dime. They move faster and more aggressively than anything happening with the issuer’s fundamentals. And yes, by extrapolation, entire sectors or country stock markets do the same. The fact that stocks and stock markets can turn on a dime is one of the most frustrating aspects of investing. Just when most investors have told themselves the same story so convincingly and memorably, the story changes. But not everyone is ready to abandon the story they’ve embraced all at once. If ___ comes to pass, then ___ should be the result. But if ___ doesn’t, then ___ becomes less likely. If that lack of conviction frustrates you, you probably aren’t cut out for markets, anyway. In January, the SPX’s weekly RSI exceeded 90, its highest on record. In December it hit 31, the lowest since 2011. It’s easy to say that 2019 will settle somewhere in between, but a failure to hold above the 50 level on the next meaningful rally would be a negative tell for the medium-term. To have the highest RSI on record to begin a year and then end plumbing the depths of recent history – that’s quite a turn. It didn’t announce itself, it just happened. In January, there wasn’t a single indicator that could have warned you. The only preparation for this sort of thing is to be armed with historical context – and the history of markets suggests that anything can happen, at any time. Hence the need to build strategies that can endure all events, even low probability ones. * there are exceptions to this, of course. one-drug biotechs absolutely can see their fundamental outlook stop on a dime and reverse, from something like a partnership announcement, an insurance company approval, an FDA approval, etc. There are others. In my August 22nd post, “A Falling Knife or Opportunity of the Year”, I wrote about the possibility of “one heck of a reversion to the mean profit opportunity” setting up in coffee. What had my interest was the fact it was massively oversold condition, sitting on very important support and most importantly the smart money was long … very long coffee futures. 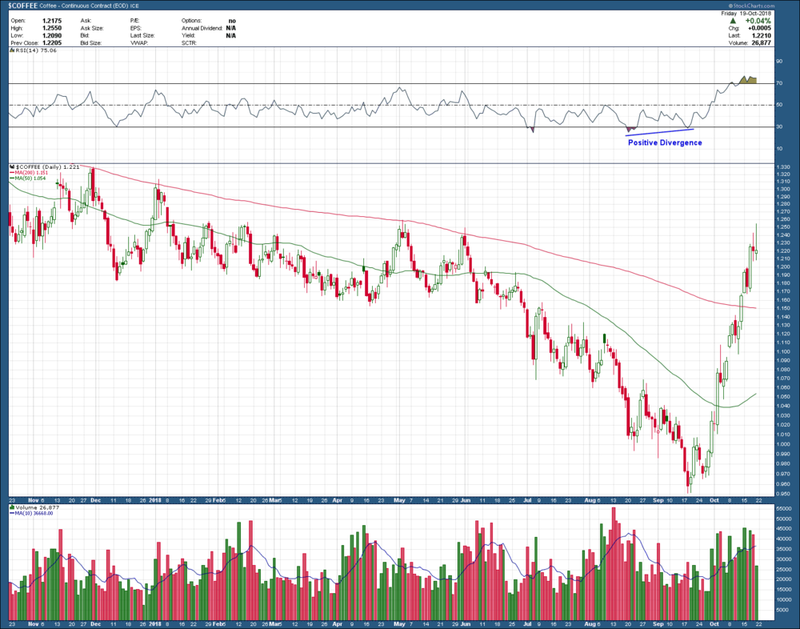 Here was the long-term chart of coffee futures I posted. Right after the original post, coffee went on to make one lower low in price (which took a month to unfold), at the same time RSI momentum formed positive divergence before coffee’s price reversed course to the upside. What occurred next was a 30%+ rise … in just 22 trading sessions. At this point though it is overbought, run into major overhead resistance (supply), has formed negative RSI divergence and closed last week with 2 indecision doji candles, one being a gravestone. This is enough of a warning for me that the current run is tired and likely done. This type of movement is every traders/investor’s dream and when they occur are usually caused by a short squeeze. For those that are short, when the price of the investment begins to move higher, the higher the price goes, the more investors buy back shares to close out their short positions. This covering is the fuel needed to push the prices higher and higher. Every squeeze eventually run out of gas once most of the short positions have been covered and are usually followed by a big reversal to the downside. So, if you are lucky enough to be on the right side of a squeeze, try and ride it for as long as it wants to go and then get ready to get the heck out of Dodge before the rug gets pulled out from underneath you.